Qvach - Security Operation Center (SOC) | Pyramid Cyber Security & Forensic Pvt. Ltd.
QVACH is Security Operation Center (SOC) helps you to manage and orchestrate security operations and analytics with the essential tools for vulnerability and threat intelligence management, threat hunting, and malware containment. The QVACH stack built as a hybrid distributed architecture provides a highly scalable capability for analysis and correlation of security logs from multiple sources in infrastructure spread across geographies and intelligence feeds. 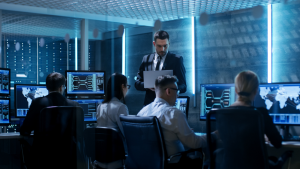 This platform is created to provide a simple solution for your security operations team for threat correlation, leveraging vulnerability libraries and risk advisories to create smart alerts, the ability to create customized meaningful dashboards for management reporting. The platform is available for internal operations or as a Managed SOC Service and is the most flexible in the industry, addressing most service permutations preferred customers. 24/7 Operational automated threat research center. Build on the highly scalable big data platform. Tested to query up to 1 million records per minute. Ability to ingest custom application and multiline logs easily. Correlate any data in real time or historical references. Readymade Log Shippers with the unique ability to cater to unstructured data. Rule and behaviour-based alerts for security incidents.